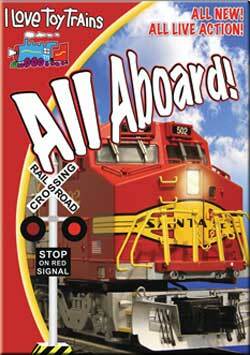 A new, exciting I Love Toy Trains show for a new generation. More spectacular special effects than ever seen in a train video before - flying saucers, UFOs, jet airplanes, jet trains, aliens, ghosts and goblins, and your favorite candies being loaded and unloaded on Lionel accessories at the Big Rock Candy Mountain. See the world's largest G-scale, outdoor layout, a giant Lego layout plus six new songs by our favorite singer/songwriter, James Coffey. The 14-part I Love Toy Trains is one of the best-selling childrens' video series in the country. It has thrilled and delighted millions of kids and grown-ups. I Love Toy Trains - All Aboard! is wall-to-wall train action for a new generation of train fanatics. There's so much train action and fun, you'll need repeated viewings to see everything. I Love Toy Trains - All Aboarrrd! chris collins (fletcher north carolina) on 2014-06-24 17:52:50.